Could you give us a brief overview on BCH Electric? BCH Electric Limited is a 53-year old company and is one of the pioneers of introducing switchgears. Our journey started with joint venture with Cutler Hammer. Today, we offer products for working in toughest conditions anywhere in the country. We are offering industrial products starting from the switchgear, control gears, brakes and brake panels for crane, limit switches, foot switches and other such products. Over the years, we have introduced industrial enclosures having IP66 enclosures. We have enclosures that can be used in PCC/MCC as well as in the telecom industry. In terms of controls, we extended our range in panels, Intelligent Motor Control Center (IMCC). At Elecrama, we had an opportunity of introducing MCB, RCCB and distribution boxes. We have also extended our range of contactors with vacuum contactors as well as overload relay. Today, with the advent of technology, we have developed smart starters aimed at making life of farmers easy. The smart starter can be controlled virtually through a smartphone. This is in lines with the PM Narendra Modi’s emphasis on development of rural areas and our way of extending our support to farmers of the country. How is smart starter technology a way forward in the direction of digitalization? Starter is the product which starts the pump. As the starter was placed near the pump, so to start the pump, the farmer had to physically operate the same. In most of the rural part of the country, electricity used to be available only at night, and that too fluctuating at regular interval, so it was adding to farmers inconvenience to turn on the pump again and again due to power cut at regular intervals. Therefore, to end the woes of farmers to an extent, we have developed smart starter which can be control by a phone, where the farmer has to input the instructions of On/Off without being physically present near the pump. The statistical data of how much water is flowing is available within the application and accordingly helps the famer to control the pump at his convenience. So, yes such a technology which adds to ease of operation and productivity is a way forward in the direction of digitalisation. How do you plan to compete with pioneers like Siemens in the industry? At BCH, we believe that we are better at providing quality products in comparison to other industry counterparts. We also offer competitive pricing for most of our products, in regards to few products, there is a surge in pricing because of matrix and demand of that kind of product. Yes, we are competing today in the price which is commercially viable. Today, we are providing techno-commercial solution to the industry. Does BCH have export presence as well? It has been years since BCH ventured into the international market. At present, we have extended our reach to SAARC nations like Bangladesh, Nepal and Sri Lanka and to some extent to Gulf i.e. Oman & Dubai. We have also managed to tap few countries in Africa as well. Till now, we have grossed business of around Rs 8 crores from our exports, We are presently much focussed on export in countries like Africa, Nigeria, South Africa, Kenya, and Indonesia, so our focus in on developing countries at this moment as our products are aimed at the same. With investments happening in railways sector for its expansions, how do you see opportunities in this segment? BCH has been a pioneer in its product offers for the railways. Our products are used in the coaches as well other application. Railways are one of the key industries where the company is focus as it has products which can go in the same. There are two products which is going into coaches i.e. contactors and plug-in sockets. Apart from this, we are developing certain products i.e. the contactor which will replaced the imported part. We are also working on RDSO and DLW at our R&D centre. These products can be used in Metro Train as well but with different specifications. BCH is geared up to cater to specific product requirement of Metro as well. What is BCH’s production capacity at present & where are these capacities based out of? We have two production facilities in the country. One is situated in Faridabad and another one in Rudrapur, Uttarakhand. We have quite lot capacity and can expand our production by 30-40 per cent, which can reach up to Rs 500 crore without investing much in the same. We will be enhancing the production capacity with technological advanced machinery and capital for the same in the future. What are the products BCH is looking to invest in? BCH is investing in Enclosure business as we see a huge potential in the same. We also look at enhancing contactors product line up, which is our core product. So, these are two products where we contemplate to infuse our investments into. We also have strategy of sourcing certain products from organised vendor to add up to our turnover from infra products like circuit breakers, cables and wires. It’s our branding strategy. BCH is known for quality and it’s our QA department is efficient in fulfilling their job. Even while selecting vendor, due diligence is maintained. We have stringent vendor selection process in place to ensure best quality is maintained. It’s a continuous process to ensure the quality remains intact. 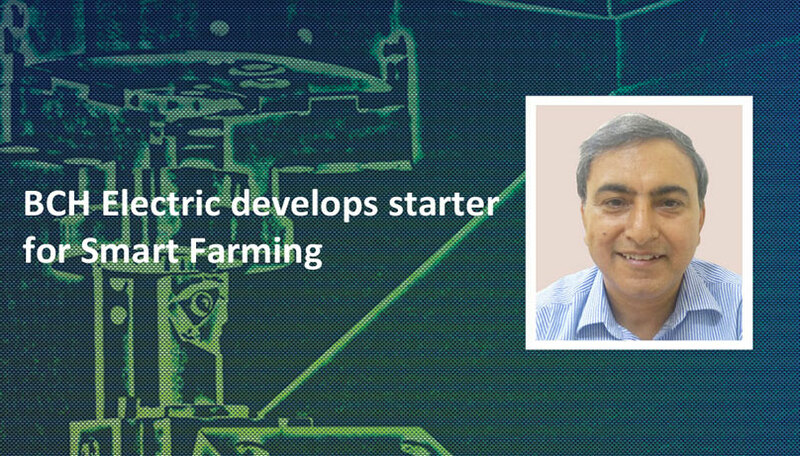 To end the woes of farmers to an extent, we have developed smart starter which can be control by a phone, where the farmer has to input the instructions of On/Off without being physically present near the pump.